The Corrective services chapter (chapter 8) reports on prison custody and a range of community corrections orders and programs for adult offenders which are delivered separately by the eight States and Territories. This chapter reports on prison custody and a range of community corrections orders and programs for adult offenders which are delivered separately by the eight States and Territories. In 2014-15, on average 34 982 people per day were held in Australian prisons — an increase of 7.0 per cent from 2013-14. Nationally, 18.3 per cent of the total prisoner population (excluding periodic detainees) were held in privately operated facilities. Males comprised 92.2 per cent of all prisoners in prison custody in Australia and 7.8 per cent were females. Aboriginal and Torres Strait Islander prisoners comprised 27.6 per cent of the total prisoner population. Nationally, corrective services agencies operated 111 custodial facilities at 30 June 2015. Community corrections is responsible for a range of non-custodial sanctions and also manages prisoners who are released into the community and continue to be subject to corrective services supervision. In some jurisdictions, community corrections responsibility includes managing offenders on supervised bail orders. Nationally, an average of 57 429 offenders per day were serving community corrections orders in 2014-15 — an increase of 2.0 per cent from 2013-14. Males comprised 81.6 per cent of the daily number of offenders serving community corrections orders and 18.4 per cent were females. Aboriginal and Torres Strait Islander offenders comprised 20.0 per cent of the total offender population. Nationally in 2014-15, net operating expenditure on corrective services including depreciation was $3.7 billion. provide program interventions to reduce the risk of re-offending. 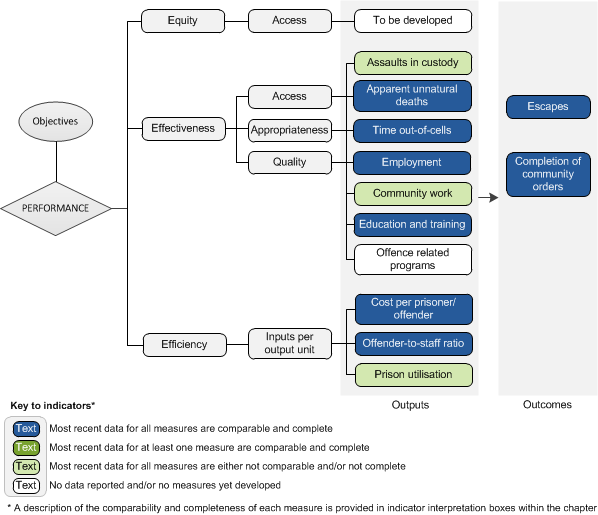 The performance indicator framework provides information on equity, efficiency and effectiveness, and distinguishes the outputs and outcomes of corrective services. The performance indicator framework shows which data are complete and comparable in the 2016 Report. An overview of the Corrective services performance indicator results are presented. Information to assist the interpretation of these data can be found in the indicator interpretation boxes in the Corrective services chapter and attachment tables. Most recent data for this measure are comparable and complete (chapter 8), except for NT where data were based on a single point in time. Most recent data for this measure are comparable and complete, subject to caveats (chapter 8). Most recent data for this measure are comparable (subject to caveats) but not complete (chapter 8). Data are not available for NSW or Tasmania. a Caveats for these data are available in Chapter 8 and Attachment 8A. Refer to the indicator interpretation boxes in chapter 8 for information to assist with interpreting data presented in this table. b These data are derived from detailed data in Chapter 8 and Attachment 8A. - Nil or rounded to zero. Performance indicator data for Aboriginal and Torres Strait Islander people in this chapter are available in the attachment tables listed below. Contextual data and further supporting information can be found in the chapter.